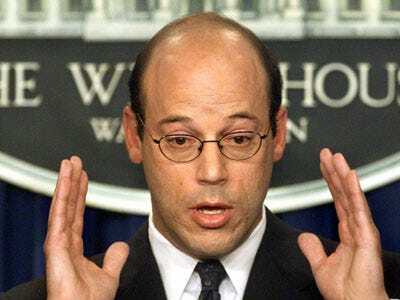 Ari Fleischer is quitting Tiger Woods. The former White House press secretary told the Associated Press in an email that he is no longer working for Woods. The sports consultant specializing in damaged stars did not admit to the press until now that he was whispering advice to Woods. So why did he “withdraw,” as the Associated Press puts it? Were the raunchy text messages too much for him? Was he upset about getting railed in the press for joining the Tiger Woods comeback team? Was he blindsided by Sunday’s mini-interviews? We left messages for Ari at his office and anxiously await his reply. Perhaps Tiger was brushing away Ari’s PR pixie dust and wanted to create his own image instead of pick one from his catalogue, as Gene Wojciechowski at ESPN puts it. According to FoxSports, “Fleischer’s legacy, whether fairly or not, remains propagating Bush/Cheney myths — like Saddam Hussein attacked America on Sept. 11, 2001 — which Americans don’t want to hear. Having him in behind the curtain gave the impression Woods had something to hide, and that words were being fed to him. Sounds about right. But we’d like to hear it from Ari himself.